Logistics: click here for information on travel and accommodations. Ubiquity Chartres Community Webinars – Join the faculty and participants in our monthly webinar on the second Sunday of every month for discussions on the topics included in the intensive. Register for the Webinars. This pilgrimage will center us deeply in the heart of Chartres. We will be there on the Feast of the Assumption of Mary (August 15) which honors the Church doctrine, enunciated by the Pope in 1950, that Mary was assumed directly into heaven upon her death and now presides as the Mother of God. Carl Jung believed that this doctrine elevating the feminine into the Godhead marked the most important development in Christian theology in the last 2000 years. This year’s Feast coincides with the full moon. A city that has reverenced the feminine for several thousand years, honors the feminine in the deepest of ways. On the Day of the Assumption, the Black Madonna is carried through the streets before being placed in front of the statue of the Assumption of Mary, where she is kept for one week and then hidden away till the following year. It is in this sacred space that we will deeply explore the nature and scope of the dark feminine as manifested in the Black Madonna. The dark feminine in all her aspects has been revered since ancient times. She was refracted through the great goddess of antiquity such as Innana and Isis, Kali and Quan Yin. There are over 300 statues and sacred sites in Europe alone dedicated to the Black Madonna, the most famous and revered of which is at Rocamadour in France. One of the critical issues we will explore is how the Black Madonna is present today in world affairs and personal transformation. She has historically been present during times of turbulence and upheaval when a culture or civilization is dying and something profound and redemptive is being born. The metamorphosis from the old to the new is uniquely the domain of the Black Madonna, which is why she is so actively present in our lives today. A profound aspect of the Black Madonna is the manner in which she challenges our understanding of what it means to be feminine. In this spirit, we will explore new visions of the relationship between the feminine and masculine, so powerfully depicted in the north (Mary) and south (Christ) rose windows of the cathedral. We will contemplate the nature of the Hieros Gamos, the classical term for when the king or high priest would copulate with the high priestess in Springtime to ensure the fertility of the crops. How do we revision and rework these themes into a new understanding of true union? There is no issue challenging human society more than how we understand the relationship between the feminine and the masculine in the aftermath of 5,000 years of patriarchy. Since civilization began, the feminine and the masculine have been split from one another with the feminine subordinate to the masculine. Today, patriarchy is collapsing around us and the rise of women all over the world offers an unprecedented opportunity to revision the relationship between the sexes, the cosmic archetypal forms of feminine and masculine, and their union. With women rising around the world, how do men define their masculinity? How does the masculine revision itself in a way that is aligned with the rising feminine? Is it time to return to the primordial spirituality of the Great Mother when the masculine was viewed as an aspect of the Mother and was even sometimes depicted as within the womb of the Mother? How do women define themselves in relation to the new men? Given the urgency of our time, the answer to these questions may not only be crucial to human survival but help shape the ethos of the civilization to come. 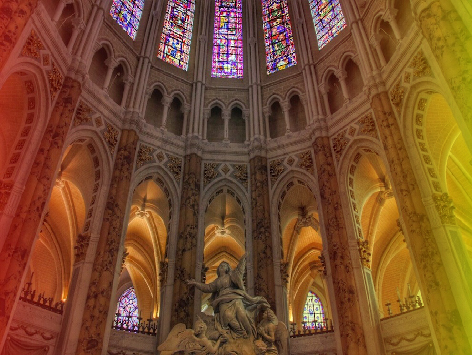 There is nowhere where this exploration is more appropriate than Chartres, the locus of sacred power of the feminine since time immemorial, and the cathedral that represents the union of the feminine and the divine masculine in full splendor. Ubiquity Chartres Academy was founded in 2006 to commemorate the founding of the original Chartres Academy by Fulbert in 1006. 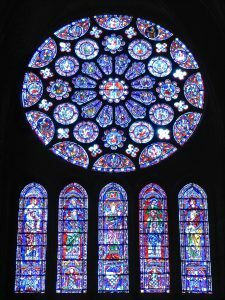 We have been coming to Chartres now for thirteen years, a number known in sacred geometry as “twelve around the one.” Jesus and his disciples were twelve around the one. 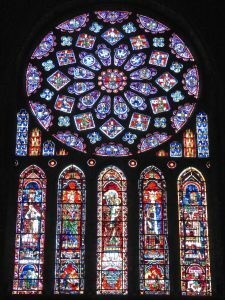 The Rose windows depicting Mary and Christ in Chartres cathedral are structured as twelve around the one. It is a symbol of completion and thus a time for renewal. In 2019, we will be starting a new cycle of twelve around the one. Our first cycle was centered around Fulbert and Plato, thus very masculine. The new one needs to be around Mary and the Black Madonna, thus very feminine. Anne Baring, PhD, author and co-author of 7 books will join in a live virtual dialogue with Andrew Harvey on the history of the Great Mother and her vision of a new relationship between the feminine and the masculine energies. Apela Colorado, PhD, indigenous scientist of the Oneida-Gaul ancestry will lead the invocations and rituals. Ruth Cunningham, classically trained musician, sound healer and founding member of the Anonymous 4 will create soundscapes. Jim Garrison, PhD will moderate the proceedings, speak on various aspects of the Assumption of Mary and of Gaia as a new organizing framework for spiritual development, and lead the sessions for men to come in touch and honor their true masculinity. Andrew Harvey, PhD (Hons), scholar, mystic and author of more than 30 books, will dialogue with Anne Baring, sharing his understanding of the Black Madonna and vision of a new relationship between the feminine and the masculine. Peggy Rubin, Shakespearian actor and master of sacred ritual and group theatre, will share her deep insights into the nature of the Black Madonna and how to use the transformational energy of the the feminine for personal growth and group harmony. Banafsheh Sayyad, MFA, MA, sacred dancer and choreographer who is shaping the new expression of the Chartres Academy as Creative Director of the Ubiquity University, will guide us to embody the ideas explored during the week, and lead the sessions for women to awaken their feminine energy. Each day will include Sacred Practice, an opening Session, presentations on the Assumption, the Black Madonna, the feminine and masculine energies, a sound bath, sacred dance, immersion in the Cathedral, and personal time for meditation and exploration. Women and men will meet separately and together during the course of our time together. We plan to have one private evening in the cathedral devoted to walking the labyrinth, accompanied by Gregorian chant, and another private evening in the lower church (crypt). We will spend time in the cathedral reflecting on the many aspects of Mary and communing with the Black Madonna. Requirement for BA students is a 12-15 page paper, and Doctoral students, a 20-25 page paper, focused on one or more aspects of the relationship between the sacred feminine and sacred masculine, as well as new forms of their union or Hieros Gamos, weaving together content from the lectures, discussions, artistic activities, reading materials and your experiences related to the entire course. Artistic work is welcome to supplement your paper. Note: Above fees DO NOT include travel and accommodations.